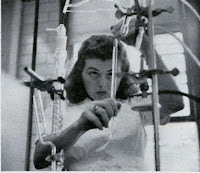 Modern Mechanix recently posted an article from the January 1949 issue of Science Illustrated, titled "Girl Chemist." It profiles 22-year-old Simmons College graduate Jacqueline "Jackie" Bates, a chemist at the Monsanto Chemical Company division in Everett, Massachusetts. At the time the article was written, 20% of Monsanto's Everett research staff was female*. Although it is a lonely, tense, exacting, sometimes frustrating profession, she enjoys it. She finds her work satisfying, her day full, her advancement altogether satisfactory. After 18 months on the job she regards herself as a veteran: “The sulphur dioxide smell doesn’t bother me any more.” (It’s common at a sulfuric acid plant, but visitors unaccustomed to it notice it.) Jackie’s working day begins at 7:30, when Robert Voigt, a chemical engineer at the laboratory, picks her up at her home in Arlington, Mass., for the 15-mile drive to the huge, sprawling Monsanto plant on the outskirts of Boston. She makes a hurried change from street dress to white uniform and is at her post in the lab shortly alter eight. She works steadily through the morning with time out only for coffee, which she has in the lab. Lunch at noon comes on a tray from the company cafeteria, if experiments in progress cannot be left un-watched. Back at work before one, Jackie normally finishes her day by 4:45. Attractive, full of good humor, Jackie enjoys dancing, swimming, bowling and no shortage of male admirers. It's very irritating that the article makes such a point of saying that she's attractive and repeated calls her a "girl" (a 22-year old college graduate is certainly a woman). At least it mentions that she considered chemistry to be both demanding and rewarding profession. Be sure to check out the whole article, which has a great photo spread of Bates setting up and running an experiment. She seems underdressed without the lab coat, gloves and safety goggles that are de regueur in a modern chemistry lab. I wonder what ever happened to her. * When this article was written in 1949, 7% of chemists in industry were women. That percentage has been slowly creeping upwards, with the American Chemical Society reporting in 2003 that women are now a "strong majority" of industrial chemists under the age of 30. I imagine it will take several decades for these young female chemists to work their way up into management positions in significant numbers.